Reasons for Reading: I wanted another eAudio. Also, I wanted something very different from Black Like Me. 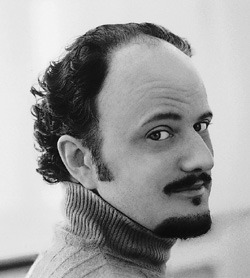 When I saw a biography of Georgia O’Keeffe, I felt I’d achieved that. All I remembered about her was that she was an artist that one of my sixth grade teachers said painted whatever she saw around her. While I found this simplistic, I felt there must be more to Georgia O’Keeffe. So, I checked it out via HCPL Overdrive and ultimately listened to it on my Nook Tablet. Summary: This book takes on the true story of the American iconoclast – Georgia O’Keeffe. O’Keeffe marched to the beat of her own drummer perhaps from the beginning. Her larger than life story, bigger than some of her canvasses, draws interest.This artist lived nearly a century, one marked in change and evolution. Just the roles she played throughout her life – woman, artist, muse, lover, wife, friend, etc don’t begin to define her. 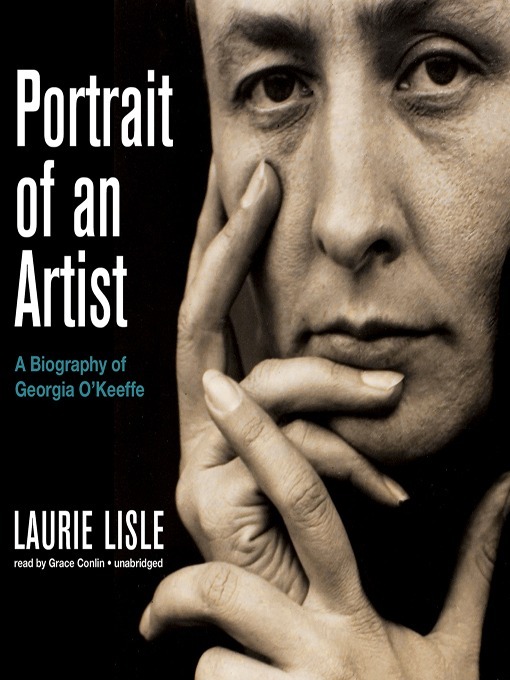 One Thing I Learned from reading Laurie Lisle’s Portrait of an Artist: A Biography of Georgia O’Keeffe: O’Keeffe was the namesake of her maternal grandfather – George Victor Totto, a Hungarian count who came to the US in 1848. What I Liked: I liked that the author expressed herself in an objective way. Lisle portrayed O’Keeffe, warts and all, as the saying goes. She also described O’Keeffe’s mercurial ways very well. What I Disliked: I blame myself for this. When I read about a visual artist in the future, I must skip an audiobook. I truly must see the pictures. While this encouraged me to browse online for O’Keeffe’s art, it was rather inconvenient listening to this on my work commute. Reasons for Reading : I sought a quick read and noticed a copy of Sandra Brown’s Rainwater setting on the shelf. Seeing the book reminded me that someone had recommended this as something different written by Sandra Brown. So, I checked it out from HCPL. Summary : An older proprietor of Solly’s, an antiques store out in the middle of Nowhere, Texas receives a visit from well-to-do customers on their way back to Oklahoma. The wife asks the proprietor about the cost of his handsome pocket watch. The proprietor shakes his head and says it’s not for sale. The peculiarity of the name Solly leads the proprietor to tell the story of how the store came to be. Back in 1934, Ella Barron runs a boardinghouse she inherited from her late parents. She rears her son Solly, a young boy like no other. Ella works hard and does her best to ignore pitying glances. Things aren’t going well for the town as government slaughters cattle and leaves them for dead in order to drive up prices. Then, the town doctor brings his enigmatic cousin, David Rainwater, to the doorstep of Ella’s boardinghouse. Now, a woman who wishes not for charity has to make room for Rainwater as he is the only one who can work with Solly. Rainwater also turns narrow-minded town bullies on their heads. Ella’s existence of order and chores turns as she comes to life. What I Liked : I liked the change of pace for Brown. While Brown doesn’t neglect her textured character studies and rich dialogue of her thrillers, Rainwater is not what I’d call a thriller. It’s historical fiction; it’s romantic. Some may call it a gentle read, even. I appreciated the tenderness the author extended to Solly, a child with autism but without a climate to accommodate him. I identified especially with the story line of the cattle slaughter as I had heard about it. What I Disliked : I only wish Brown would write a few more along these lines. Yes, I enjoy thrill rides but I like leisurely strolls, too. One friend of mine noticed this most curious title on the NYT Bestsellers list. The name compelled her to request the book via HCPL and read it. She recommended it highly for two years. So, this summer, I requested it myself. The book was a collaborative effort between the late Mary Ann Shaffer and her niece Annie Barrows. Shaffer and Barrows tell their tale through correspondence; this is an epistolary novel. 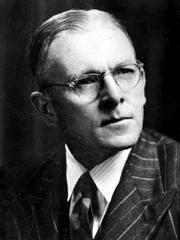 The letters begin in early 1946. London writer Juliet Ashton receives a letter from Dawsey Adams from the Channel Islands, Guernsey to be exact. 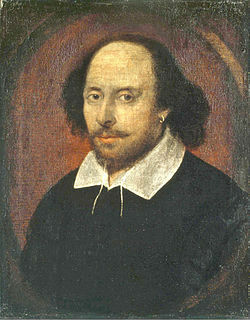 Dawsey is the current owner of a Charles Lamb book which once belonged to Juliet. Their correspondence leads to discussion of the Guernsey Literary and Potato Peel Pie Society, a book club which met on Guernsey Island during the German Occupation. Through many letters, Juliet discovers the light of literature and new friends. While I felt the book slow in the beginning, I soon found myself riveted. I enjoyed several of the characters and I loved how the authors allowed the characters to speak for themselves. Juliet was my favorite character. At a point fairly early in the book, Juliet requests references from two people – a man who will sing her praises and a woman who will expose all of Juliet’s warts. Juliet’s spirit leapt from the pages. While this takes place after World War II in England, negativity and bleakness are part of the picture. However, these people rise above this and look forward to their brighter futures. So, when’s the movie coming to a theater near me? Today is Frida Kahlo’s birthday. 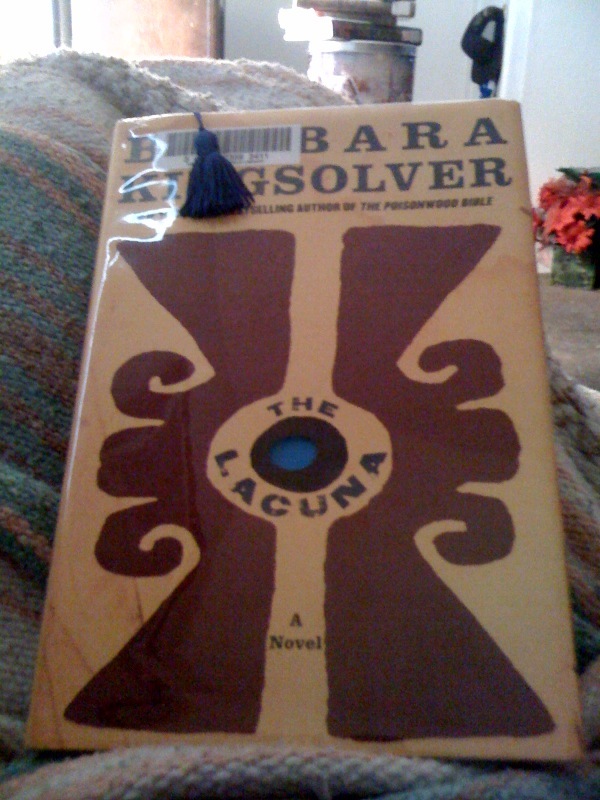 In Barbara Kingsolver’s The Lacuna, Kahlo and protagonist Harrison Shepherd shared a birthday – 06 July. Entertainment | 07/06/2010Frida Kahlo’s 103rd birthday celebrated with Google doodleBy Anthony BenignoToday would be Frida Kahlo’s 103rd birthday, and Google is doling out a special gift to celebrate the painter’s life and contribution to the art scene. I read much of this on the living room couch under the blanket. It's been a cold winter in Texas! Back in high school, I picked up Barbara Kingsolver’s The Bean Trees for an English class assignment. Even though one of my guy friends berated the book and me, I enjoyed reading The Bean Trees. Then, I read The Poisonwood Bible for one of courses in college. While this book wasn’t so funny, I was enthralled by Kingsolver’s skill at presenting the same story from multiple perspectives. In fact, I consider The Poisonwood Bible one of my favorites. 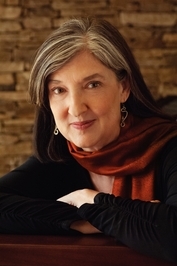 When Kingsolver’s The Lacuna came out in 2009, I placed a request on her latest book. After checking out the book five times, I managed to finish The Lacuna. Harrison William Shepherd is the son of an American father and a Mexican father. His parents have split and Harrison spends his formative years bouncing between Dad and Mom, United States and Mexico. The book starts in 1929, when his mom, Salome, has dragged her passive son with her to the remote Isla Pixol, Mexico. They live her rich boyfriend and Harrison nothing but time on his hands. He discovers pastry-making with the household cook, Leandro, and a lacuna in the sea. Also, Salome presses upon him the need to write, to record his passage through life. After an unsuccessful stint in a U.S. military academy, the young man finds himself keeping a journal as a domestic employee of Diego Rivera. Here, he rubs elbows with Rivera, Kahlo, and an exiled Trotsky. 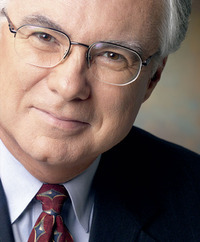 When circumstances bring Shepherd back to the United States, he publishes novels about the Azteca. The Lacuna itself contains many of Shepherd’s journals, letters, articles, and when needed, explanation from his right hand and future archivist, Violet Brown. 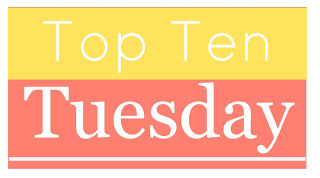 Kingsolver deals in many themes here – culture clash/shock, fear, prejudice, and alienation. While I found Shepherd compelling and I cared enough about him that I wanted to know what happened to the guy, I felt that I was kept at arm’s length. I couldn’t really know this man. 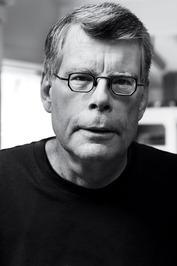 As Violet Brown described him, he was a watcher rather than an actor. His words are beautiful but Shepherd is so remote. I’m divided about the real people of the book. When I did a project about Rivera in high school, I had much the same sense of the muralist as portrayed in the book. Frida Kahlo as a fierce Aztec queen is right on the money. Yet, the amateur historian (okay, I minored in History) within me doesn’t find this kosher. I think The Poisonwood Bible is a far better work. The Price women were just that – women. In that book, only the females talked to the reader. In The Lacuna, Shepherd, a man, feels cold even when my brain says that’s he’s not. I craved the words of Violet so much more simply because she was a woman and Kingsolver knows women. Whether or not Shepherd was gay doesn’t make a difference when it comes to writing a man in first person. Beautiful prose but not completely natural. . .